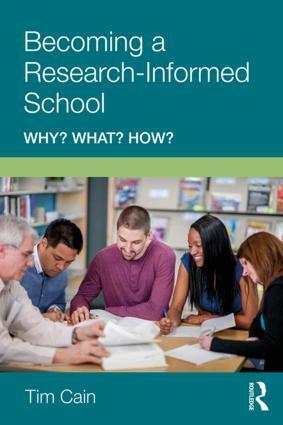 Becoming a Research-Informed School examines the reasons why teachers and leaders use research to improve their schools, and explores how teachers select, understand and use research to enhance learning experiences in fast-moving classroom environments. It analyses what teachers and school leaders actually do, to use research in their schools, and how they build a research-informed culture. It considers key topics including Teacher Research, Lesson Study, the use of data to effect improvements, navigating social media and blogs, and how to overcome common obstacles to research use in schools. Becoming a Research-Informed School is full of rich, detailed examples of research and research utilisation. It is an indispensable resource for teachers and leaders who wish to take an informed approach to creating a professional learning community.